Samsung ProXpress C4060FX Driver Download. Samsung launches the C40 color range, a compact A4 series for small structures that have strong printing needs. The C4060 uses an Android platform. Samsung announces the launch of the C40 range, a new A4 series at the forefront of innovation. It combines state-of-the-art Android printing and high-performance printing solutions in a remarkably compact format. This new range, available from July 1st 2017, includes the C4060 multifunction, equipped with the Smart UX Center, and a single printer version (C4010). 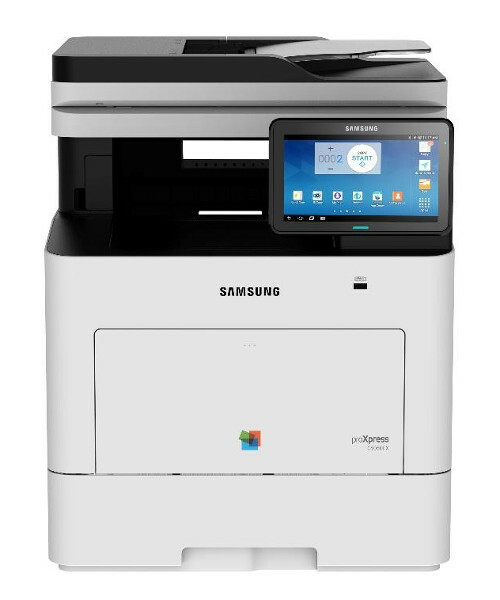 The Samsung ProXpress C4060FX printer is the first A4 color multifunction to benefit from the Smart UX Center, a 100% Android platform, exclusive to Samsung products, for a simple and intuitive use thanks to its 7-inch touch pad. Revolutionary, the Smart UX Center makes it possible to simplify the use of the multifunction thanks to a familiar interface, user-friendly and customizable. With Printing App Center 2.0, the application portal dedicated to printing, companies can install applications that meet their specific needs. Interventions from remote technicians, document editions, remote printing, are some examples of the possibilities offered by apps and widgets for download on the Printing App Center 2.0. These C40 series delivers high-level performance to meet demanding A4 printing requirements. Printing 40 pages per minute, it can print from 5,000 to 6,000 pages per month. With capacities of up to 15,000 pages in black and 10,000 in color, toners have been optimized to last over time and reduce the frequency of renewal. The series also has a large capacity (2,250 sheets), which leaves the latitude to print continuously without constant refills. When it comes to scanning, this Samsung ProXpress C4060FX can process up to 60 frames per minute, thanks to Dual Scan technology, which allows you to scan both sides in one pass. It is thus perfectly adapted to the needs of document management, dematerialization and archiving. The compact design of the two models in the C40 series can be installed on a desktop or integrated into a printing pole by adding bins and Base, without requiring additional purchase of furniture. It will respond perfectly to the needs of small structures with significant printing and digitizing needs, such as law firms, notarial studies, real estate or financial agencies.